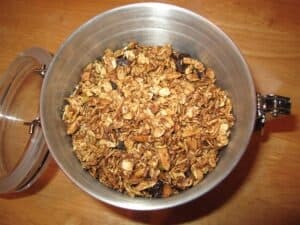 Granola is one of those seemingly healthy foods. Dried fruit, oats and nuts sound innocent but when they’re wrapped in a blanket of syrup, it’s a caloric nightmare. I very rarely reference calories, but when the average cup has 500 of them, I’ve got to step in. 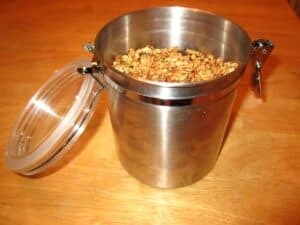 Lucky for you, I’m here to share my all time favorite granola recipe with you. Lower in sugar than most store bought brands, it packs in tons of nutrition with added wheat germ, bran, flaxseeds, and almonds. The best part about this recipe is that you can be as creative as you like. Sometimes I make it with diced apricots and pistachios. Delicious! My favorite way to eat granola is topped with almond milk. What’s yours? Preheat oven to 350 degrees. Combine the oats, wheat bran, wheat germ, flaxseeds, cinnamon, and ginger. In a separate bowl combine the apple juice, molasses, and vanilla extract. Pour the apple juice mixture into the dry oat mixture. Stir well to combine. Pour the mixture on top a large baking sheet (might need 2) sprayed with cooking spray. Bake for 25-30 minutes until browned. Remove from over, let cool and add raisins and almonds. Store in an airtight container! Thank you so much for posting this recipe. I can’t wait to try it out! I’m trying to give my family a diet overhaul. This should be a good start. This does look great! How big is a serving- about 2/3 cup? So glad you enjoyed the recipe- yes, about 2/3 cup!